All ice melters melt ice - but Qik Joe is the best ice melter available. 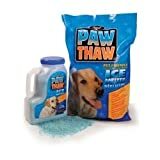 Qik Joe Ice Melt, Calcium Chloride Pellets (Peladow), is the best ice melter available. All ice melters need to form a brine solution to melt ice and snow. Qik Joe Ice Melt, with its "exothermic action", generates a great deal of heat when pulling moisture out of the air to form its brine solution. This enables it to work quickly and efficiently to melt ice and snow, even at temperatures of -25 degrees F. Rock salt, potassium chloride and blends of these and other products work much slower because they need to come in direct contact with moisture to form their brine solutions. They generate no heat and become practically ineffective at temperatures of 30 to 25 degrees F. When used as directed, Qik Joe Ice Melt should not harm concrete or vegetation. It also will not leave any white residue. Don't be fooled by the false claims of many other deicers. Choose the ice melt that is backed by a company first established, back in 1928! 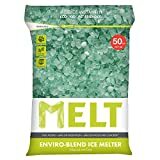 Choose Qik Joe Ice Melt! Qik Joe, 50 LB, Ice Melt Pellets, Calcium Chloride, Professional Strength Heat Generating, Melts Ice & Snow Down To Temperatures Of -25°ree. 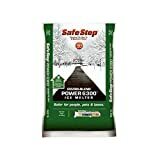 Fahrenheit, Leaves No White Residue & Will Not Harm Concrete When Used As Directed, Bag.